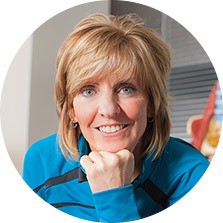 For more than 30 years, Laura has been a passionate and dedicated practitioner of stretching and fitness. She is trained and experienced in a variety of methods and techniques, and has helped hundreds of clients – in both group and private settings – discover the methods that best suit their condition and lifestyle to achieve their fitness goals. Laura is an American College of Sports Medicine Certified Trainer. She’s also a Flexibility Specialist with expertise in the Active Isolated Stretching and Strengthening Technique (AIS), which she studied under the method’s founder, Aaron L. Mattes. Most recently, she became certified in Neurokinetic Therapy (NKT), a cutting-edge technique that addresses the root cause of pain by identifying and adjusting the dysfunctional movement patterns stored in your brain.